More a fantasy writer than a sci-fi writer. 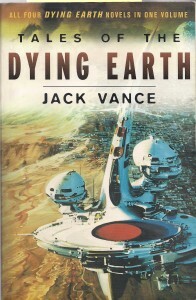 Vance was endlessly inventive, his ability to invent names, words, concepts seems limitless. I only recently discovered him and can’t stop reading his work. He also wrote detective fiction under the name Ellery Queen. so much of his work was tongue-in-cheek, funny, and once you open one of his works you are through the looking-glass. This is from The Dying Earth; his trickster figure Cugel wandering a dim earth in a future thousands of years from Now. ‘The folk who built the tree-towers were difficult to see among the shadows of the foliage. Cugel glimpsed them as they darted across their queer little windows and several times he saw them slipping into the sink-hole on slides polished from the native limestone. Their stature was that of a small human being or boy, though their countenances suggested a peculiar hybriodization of reptile, stalking bang-nose beetle or miniature gid. To cover their gray-green pelts they wore flounced belly-guards of pale fiber and caps with black ear-flaps, apparently fabricated from human skulls. ‘But if Cugel tried to travel by night he thereupon became prey for visps, which stood nine feet tall and looked across the night through luminous pink eyes and traced the scent of flesh by means of two flexible probiscises growing from each side of their scalp-crest. He approached a tree-tower somewhat isolated from the others. As he drew near he glimpsed weasel-like shapes darting back and forth in front of the windows.